Do you smell that? No, it’s not the lingering and seductive smell of overly processed greasy fast-food chicken, it’s the rank smell of DEATH! The end of days is upon us and our civilisation has come to a crashing demise. Not exactly finger lickin’ good really, is it!? What with a rise in violent crime and acid attacks in London (thanks Sadiq Khan) and the outrageous scandal of Oxfam using charitable donations to rent out prostitutes, the people of Great Britain have been having a string of bad luck lately. But nothing could be more catastrophic for the civilians of Queen Elizabeth’s patriotic country than the news that KFC has been forced to shut down most of its 900 restaurants due to a severe shortage of one major key ingredient… chicken! The Brits are known for their stiff upper lip and resistance in times of crisis. Having survived two world wars, lived through a great fire, and persevered during the great recession and social destruction of Brexit, you’d have thought that they could endure anything. But the current scenes in Britain are a far cry from ‘Keep Calm and Carry On’. There is panic, pandemonium and absolute sheer hysteria in the streets of this once great and proud nation as frenzied and desperate customers are still seeking their daily dirty dose of hot wings and Krushems, doing their very best to survive sheer starvation and rumbling stomachs. People are so hungry that you can practically see their bones. It’s like band aid all over again. The KFC chicken drought has left people feeling empty (literally) with distraught customers sharing their experience on Twitter, with one Grandad seemingly emotionally shattered that he couldn’t treat his grandkids to Colonel Sanders’ original recipe chicken. ‘Took the Grandkids out to dinner at KFC only to see that it’s shut down. Some chicken shortage. Took them to McDonald’s but it’s not the same. Crying in the bathroom. Can’t show weakness in front of them. #KFCCrisis’. Frustrated chicken lovers even resorted to contacting their local MPs and calling the police, who warned them that “fried chicken is not a police matter”. While others however were not quite as sympathetic, with one user expressing frustration at the over-reaction of chicken-hungry KFC customers. “If the closures of KFC have caused you to be panic stricken or annoyed, or have severely inconvenienced you in any way, you seriously need to re-evaluate your life”. 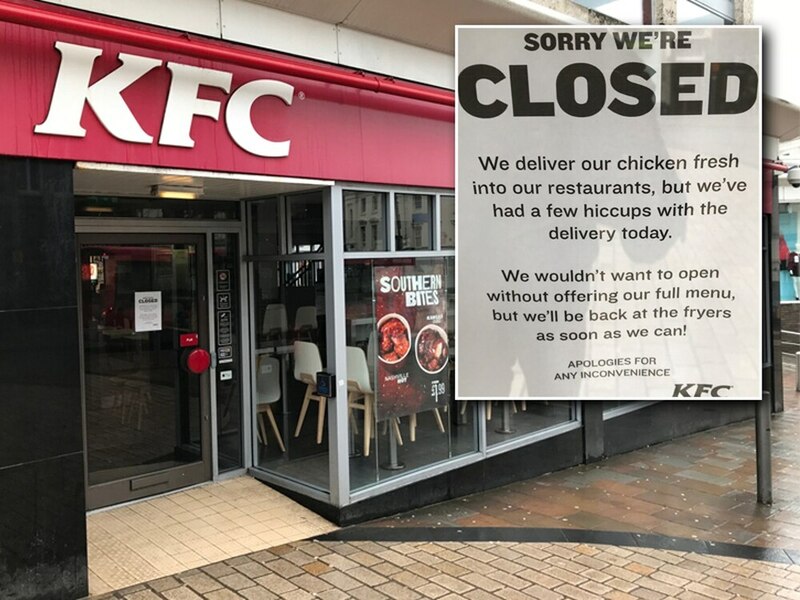 Signs were placed on KFC outlets around the country stating that restaurants had closed due to a shortage of chicken, as well as chips and other side dishes. KFC apologised for the lack of fried poultry, blaming “teething problems” with its new delivery partner. Say what now? “We’ve brought a new delivery partner onboard, but they’ve had a couple of teething problems – getting fresh chicken out to 900 restaurants across the country is pretty complex,” KFC said in an urgent public service announcement to a ravenous nation. Even though we here at Brainstain truly sympathise with the famished people of Britain, we know they will get through the rumblings of their stomachs and keep… abreast of this unfortunate situation (cool Britannia and all that!). If the people of Britain can live through a Tony Blair led government, they can live without a few pieces of KFC chicken, right?! When all is said and done, and when historians look back at 2018, they will speak with awe and astonishment at the way the nation pulled together to overcome the great KFC chicken crisis. Now, let’ all pop out for a cheeky Nando’s!